This tour explores the extraordinary outdoor area around the confluence of Dights Falls, Merri Creek and the Yarra River. This was the greatest meeting and trading area of the Kulin Nation in the 1840s. It was also the location of the Native Police, the Yarra Aboriginal School, the Aboriginal Protectorate and Dights Mill. Students can explore the trails, fauna and flora, lookouts, Indigenous locations by foot or by bicycle with an expert guide. 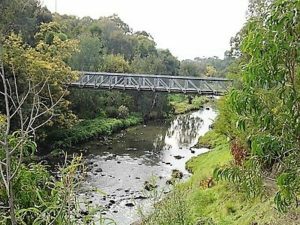 The area (Yarra Bend Park) is popular for outdoor activities such as cycling, walking, canoeing, fishing and birdwatching. Perceptions, Interactions and Impacts that the Wurundjeri people had with the Melbourne environment before and after European settlement. How the physical outdoor environment of Yarra Bend Park has influenced relationships with Indigenous people and Europeans. Relationships with Australian outdoor environments as influenced by the first non-Indigenous settlers’ experiences. Our changing relationships with outdoor environments before and after settlement. The unique nature of Australian outdoor environments..
“For the past 3 years, Catholic College Bendigo Outdoor and Environmental Studies students have met Meyer at the Merri Creek Junction for a tour of Merri creek and Yarra River on bikes. It’s the most informative tour they do throughout the year!! During the tour the students are glued to Meyer’s stories as he discusses the relationships that that the Wurunjeri people had with the landscape. He conducts hands on activities that give students an insight into how Indigenous people lived in harmony with the landscape for thousands of years. He also explores (in detail) how their culture changed after the arrival of Europeans and the different approach that white people have towards the environment. The knowledge that students get from this tour prepares them so well for SAC’s and the end of year exam. If you focus on the Wurundjeri people for Unit 3 – Outdoor and Environmental Studies, this tour is a must!! Thanks Meyer and Melbourne Walks.” Catholic College Bendigo.